Dr Rick featured in a local publication, Images Magazine. Historic preservation, rehab of old houses. Collecting antiques, antique postcards, and antique doorstops. Painting portraits and landscapes. Woodworking. Music: arranging, performing and producing CD’s of his own musical arrangements. 1969-71: Almost daily practice on Frisbee skills, throwing, running and catching, with his best friend Ken Taylor, on the beautiful lawns at UC San Diego. Always kept a Frisbee handy to relax with throughout medical school and residency in San Francisco CA, and in Tucson AZ. Dr Rick goes airborne on a drive at Kereiakes Park in the mid-1980's. 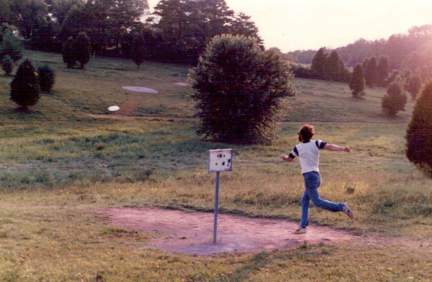 1982: Started playing disc golf at Kereiakes Park near his home in Bowling Green, KY. He used a 114 gm beach Frisbee and a 165 gm black Masters Frisbee. The next year he purchased his first "golf disc", a very heavy white Voit "Golf Disc". 1983: First tournament, Bowling Green. Played amateur (only one am division in those days), and tied for first, won the play-off. Moved up to pro. 1984: First tournament away from home, in Louisville. Won the Masters division by 13 throws, ahead of the Masters favorite, Rick Rothstein. John David handily won the Open division. 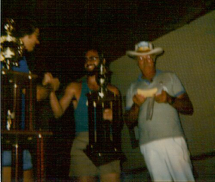 Steady Ed Headrick presented the trophies at the 1985 Worlds in Tulsa. Frisbees at a wedding? 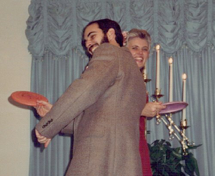 Dr Rick and Sylvia were married Jan 1, 1987. 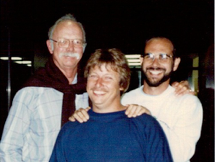 Dr Rick with Steady Ed and Ralph Beckman at the Toronto Worlds, 1987. 1986-87: Finished 4th at Worlds in 1986 and 1987, but gained experience on the PDGA Tour, winning 21 tournaments in the Masters division by the 1988 Worlds. 1987: First Open division title, Lebanon, TN. 1989: Played in 24 tournaments, in Open division, won 10 of them, and was Open division points leader that year, at the age of forty. Made the finals at Iowa Worlds, first time playing Open division at Worlds. Over the next 13 years, Dr Rick played Open division at the Worlds a total of 10 times, and made the finals in 5 of them. 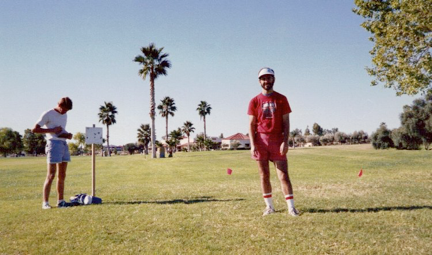 First round at Worlds 1990, Fountain Hills. Dr Rick's foursome shot a cumulative -40 that round, and included a young player named Ken Climo who went on to win his first Worlds (seen at the left). 1991: Attacked by a pit bull at Dayton Worlds, the last day of practice. Kevin Rounds and Dr Rick were playing a practice round at Triangle Park. Dr Rick threw a shot near the parking lot where a huge pit bull was chained to a car. Dr Rick reached under a tree to retrieve a disc, and as he looked up, he saw the dog in the air leaping to attack. He held up his left arm to defend himself, which the dog chomped, then bit his right wrist too. Finally Dr Rick got a grip on the dog's neck scruff with both hands and got behind him, riding him like a bucking bronco. Kevin was screaming, which brought the owner to the rescue. Bites resulted in crush injuries to both wrists but no stitches needed. Kevin had to carry Dr Rick’s bag back to the car, as both arms were temporarily paralyzed after using every ounce of energy to get injured limbs to hold on for about 5 minutes until the owner came. Later that day Dr Rick stepped in a yellow jacket nest and got stings on the right knee which made his whole leg swell up for the entire week. Dr Rick played anyway after stern coaxing from Sylvia ("You wimp! "), and made the semi-finals, where he shot 8 under par, and finished in the top 30 (Open). Players joked about avoiding Dr Rick’s foursome for fear of being hit by lightning! Historic first PDGA Board summit, Oct 16, 1993. 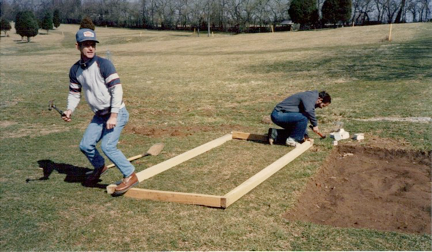 Wendel Yokley and Dr Rick constructing the first tee pads at Kereiakes Park. 1994: At Port Arthur Worlds, Dr Rick played well at the semifinals, and came up to 24th place, but got a 6-throw penalty for late scorecard which knocked him back to 40th. The round was difficult because of driving rain. Dr Rick drove in the golf cart with scorer, Roger Bunting, all the way to the course HQ, to make sure he turned in the cards. Somehow Roger managed to keep scorecards away from the TD, and took off in his car. 1995: Second year at Port Arthur, Dr Rick had a herniated lumbar disk and was wearing a cumbersome (and hot!) back brace. He decided to play Grandmaster division, and won by a dozen over Tom Monroe. The swimming pool on site was a life-saver between rounds. Also at Worlds, Dr Rick was inducted into the Hall of Fame along with Ken Climo, Dave Greenwell, John David and Johnny Roberts. The next two years, Dr Rick continued to wear the back brace for every tournament and every practice round. At Kingsport, TN Dr Rick hit his longest ace, 400 feet, on hole 18, slightly downhill with a DX Cobra. He won the tournament by one throw. 1996-97: Played Masters at the Worlds in 1996 (2nd place after Stan McDaniels), then won the Worlds in Grandmasters division in Charlotte the next year. Continued to play Open division at all other tournaments. 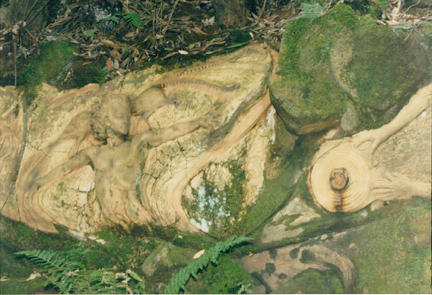 On a visit to Australia, Dr Rick and Sylvia discovered this amazing life-size sculpture on a giant rock. In aboriginal culture, the disc is the symbol of the soul. 1998: Able to play without the back brace, Dr Rick went back to playing Open division at the Worlds (Cincinnati) where he made the finals (top 12). On the final hole, with a big crowd, he announced that he was going for the ace (220 feet over water the whole way). His shot hit hard in the chains, but dribbled out, and rolled into the water. A "circle 3" was good enough to hold onto tenth place. 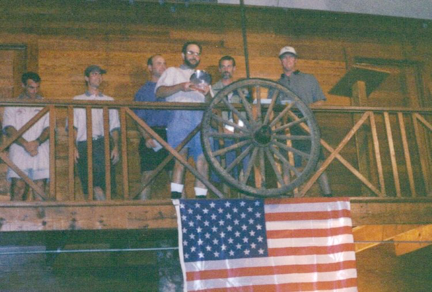 Dr Rick accepts 5th place trophy at the historic first USDGC, 1999. 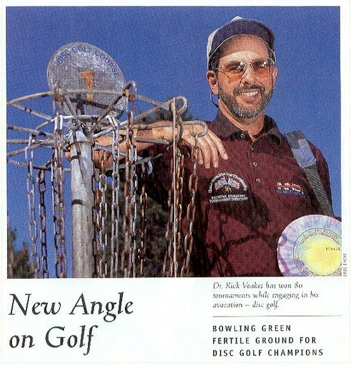 1999: The first year of the USDGC (United States Disc Golf Championship), Dr Rick made the top foursome in the final round, but struggled in the driving rain (from Hurricane Andrew!). Came in 5th, at age 50. Dr Rick was honored by being invited to join Team Champion (Innova Discs) right after the tournament. 2000: At Worlds (Ann Arbor) Dr Rick kept pace with Climo and Schultz until one bad round in the middle of the week. On the second card in the semifinals, Jesper Lundmark (European Champion) and Dr Rick were cheering each other on, while matching birdie after birdie. Jesper shot 43, and Dr Rick shot 44 on the Monster Course at Hudson Mills. They needed to catch the last two on the first card to make the finals. Dr Rick was 1 stroke ahead of Mike Randolph when they compared scores while waiting on the 18th tee. Mike had a huge drive over the trees to park the hole and finish his round with a deuce to tie it up. Dr Rick managed to save par, and went on to his last hole, the treacherous first hole. He went for broke, throwing a flippy disc with max hyzer down the narrow tube. It flattened, went fast across the open middle section and hit the gap in the woods on the far side. Perfect! But as it went down the narrow path to the basket, it lost speed and fell left at the end. Luckily it penetrated part way through the woods. Dr Rick hit a 35-footer to edge Mike for the fourth spot in the finals. Earlier that round Dr Rick had hit a 70-foot putt from the rough for a birdie 4 on hole 15 (1000+ feet). 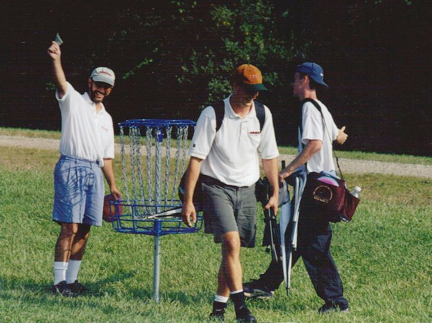 Dr Rick collects his dollar after acing the next to last hole at 2000 Doubles World Championship, moving him and his partner Barry Schultz to a one-throw lead. Eric Tracy offers the side-five, and went on to win with his partner Rivers Sherrod, after a play-off went well into the darkness of night. At age 51, Dr Rick posts an impressive win at Augusta (note cumulative scores at right, -27,-22,-19,-17,-19). 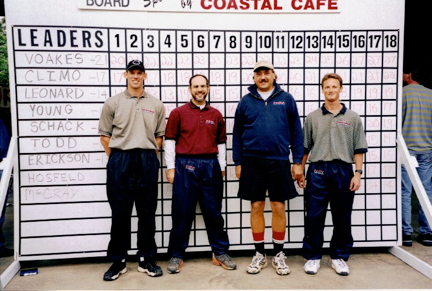 2001: Dr Rick attempted the "Iron Man" challenge at the Masters Cup, Santa Cruz. He played both Open division and Grandmasters division, by playing each round twice (once for each division). He finished top ten in the Open, and won the Grandmasters. 2002: At Houston Worlds Dr Rick was 6 throws in the lead of the Grandmasters division, on Friday afternoon. Just a few minutes before the start of the round, he threw a practice roller and ruptured a chest muscle. He was carried off the course on a golf cart and could not play for several months after that. 2003: Although still playing only Open division, Dr Rick decided to play Grandmasters again at Worlds. Dave Greenwell had just turned 50, and played Grandmasters for the first time. Dave and Dr Rick zoomed out ahead, and had an exciting finish on the challenging Flagstaff "Little America" course. Although Dr Rick got to within 2 strokes near the end, Dave finished strong to win his first Grandmasters world title. Dave creamed the field in Iowa the next year for his second Grandmasters world title, while Dr Rick came in 4th, after Snapper and Slaz (Snapper Pierson and Steve Slazor). 2005: Dr Rick discovered that ice is far more effective than Ibuprofen and cortisone shots for for elbow tendonitis, and started to increase his distance and consistency again. At Worlds in Pennsylvania, Dave Greenwell got a big lead the first day, but Dr Rick gradually worked his way back into the hunt during the week, and gained a 5-stroke lead going into the finals at Lehigh. Dave put on some great pressure, but Dr Rick was able to maintain a 2-stroke lead to win. Dr Rick continued to play well that year, and achieved his career-high player rating (1017) by the end of 2005, at the age of 56 ½. 2006: First experience in Japan! Dr Rick needed to learn to throw 150-class early in the year, so went cold-turkey (all 150-class) at the Lexington Open. It was tricky at first, but the last round he tied the course record at Shillito Park with -13. In Japan, he finished 13th, and kept playing with 150-class the next two years. Threw almost all 150-class (except one 168 gm leopard) for the entire Worlds in Augusta. Snapper Pierson was playing all out, scoring 30 points over his player rating every round (averaged 1030). Snapper and Dr Rick were tied going into the semifinals. The weather was windy and raining, but Dr Rick stuck with 150-class, even 148 gm putters (from Japan, with the Kabuki face on them). Despite two rain delays during the semifinals, Dr Rick shot 51 (8 under par) at Lake Olmstead to move into the lead. Snapper made a great comeback in the finals, but Dr Rick held on to win by one stroke. 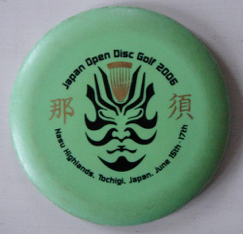 He amazed the Japanese players, who had all switched to heavy discs for the Worlds. 2007: Severely injured his right ankle just before Wisconsin Worlds, and re-injured it the first round. He eventually made the finals (Grandmasters), and moved up to third during the finals, barely able to walk. Over two months later Dr Rick was still wearing the ankle brace at the USDGC. He shot a bogie-free round (66 the last day), a rare accomplishment at Winthrop. 2008: Returned to Japan, and finished in the top 20 again, gaining the trophy for top Grandmaster player, at age 59. Also played at the USDGC for the tenth year, one of only 13 players to compete in all 10 years. 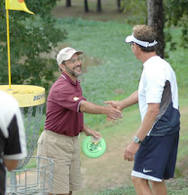 Dr Rick was the oldest player ever to shoot under par at USDGC, a 67 (-1) the last round. 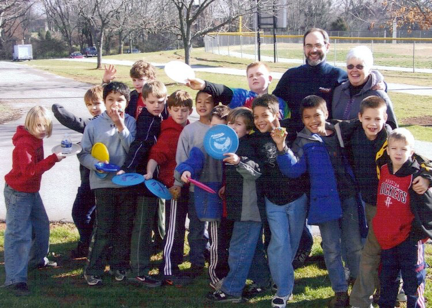 Bowling Green is STILL a fertile ground for future disc golf champions! 2010: Played in his first US Masters Championship, at Augusta GA, and won in Senior division. Won his 7th world championship, at Crown Pointe, IN, shooting the best score in his division (Senior division) in all 7 rounds. 2011: Started CrossFit training, and had knee surgery to remove damaged cartilage, came in second at Worlds in Santa Cruz. 2012: Won US Masters Championship in Louisville, and won his eight Worlds title in Charlotte NC. Came in the top 20 (15th) at USDGC, performance division. 2014: Won his ninth World Championship in Portland, Oregon. 2018: At age 69, tied Kenny Lee at Worlds, but lost in a 6 hole playoff on the challenging Waterworks course. Finished top 4 at Worlds almost all 10 years in Senior Division, except 2015 (Pittsburg) when he had to drop out the first round due to kidney stone.